TECHSPEC® Cx Series Fixed Focal Length Lenses are designed with simplicity and versatility to easily integrate into a range of application types. The modular 3-piece design allows for flexibility to integrate precision fixed apertures, internal filter holders, or liquid lenses into the assembly. These lenses also feature a simplified focus mechanism with easy to use lock nut and recessed set screws to lock focus position into place. The Cx Series lenses are ideal for applications such as machine vision, factory automation, and research and development. For further documentation information or questions regarding ease of assembly and design support, please review our quick start guides, the lens manual or contact technical support. Note: One accessory is required for use with the Cx Series lenses. Accessories available include apertures, filter holders, or liquid lens holders. 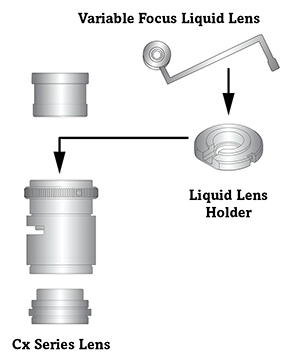 The liquid lens holders are compatible with our Variable Focus Liquid Lenses. C Series: Features locking cam focus and iris adjustment and is the most adjustable version of these optical designs; they are the typical high quality machine vision lenses. Also available with a VIS-NIR Broadband Anti-Reflection (BBAR) Coating. Ci Series: Simplified mechanics featuring fixed apertures with compact housing. Industrial Ruggedization for reduced size, cost, and locked focus. Cr Series: Stability Ruggedized with all optics glued in place and a locking C-clamp focus ring for reduced pixel shift and improved focus stability. Cx Series: Modular, flexible mechanics allows lenses to be taken apart for easy integration of accessories such as liquid lenses, apertures, and more. Liquid Lens Cx Series: Designed with an integrated liquid lens for quick autofocus. 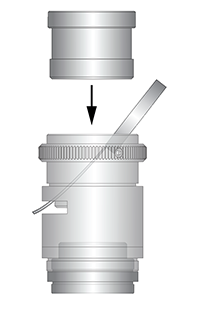 Step 1: Choose the focal length of the Cx Lens and the compatible Variable Focus Liquid Lens and Liquid Lens Holder. Or simply choose appropriate Cx Lens Kit, which includes a Cx lens and its compatible Variable Focus Liquid Lens and Liquid Lens Holder. Step 2: Mount the Variable Focus Liquid Lens into the Liquid Lens Holder. Next, assemble both items into the middle of the Cx Lens. Complete instructions can be found in the downloadable PDF manual. Step 3, Option 1: Attach Liquid Lens to a PixeLink USB 3.0 Autofocus Camera. This camera provides seamless integration - both driver and autofocus software is included. Step 3, Option 2: Use with standard C-Mount camera. Driver is not included and a separate Liquid Lens driver must be purchased separately (included in Liquid Lens Development Kit).